Background A stent is often necessary for the treatment of stroke. In such cases,it is essential for the patient to have antiplatelet therapy. There are several methods of antiaggregation, such as oral loading doses of aspirin and clopidogrel, intravenous aspirin, or intravenous glycoprotein IIb/IIIa receptor antagonists, such as abciximab. The aim of this study was to evaluate the incidence of symptomatic intracerebral hematoma (sICH) associated with our antiplatelet protocol: intravenous abciximab bolus at half the dose (0125 mg/kg) at the time of the stenting procedure; oral aspirin (150 mg) and clopidogrel (75 mg) daily added the next day after CT shows no significant hematoma. Materials and methods Retrospective review of our database of endovascular management of large acute vessel occlusion treated with intravenous abciximab between January 2015 and March 2018. Demographics data, material, drugs, and complications were registered. Fisher tests were used to compare the incidence of sICH in the literature where abciximab 0.25 mg/kg plus maintenance doses are often administrated. Results Intravenous abciximab was administered to 99 patients. No sICH was observed. According to the European Cooperative Acute Stroke Study Scale, there were 8 cases of hemorrhagic infarction 1, 5 cases of hemorrhagic infarction 2, 4 cases of parenchymal hemorrhage 1, and no cases of parenchymal hemorrhage 2. A comparison between sICH with conventional antiplatelet doses based on the literature showed a statistically significant difference favoring our protocol. Conclusion In the endovascular treatment of acute ischemic stroke, a bolus dose of 0125 mg/kg of abciximab with no maintenance doses, followed by 150 mg of aspirin and 75 mg of clopidogrel orally the next day, is safe and effective. In this acute period, the use of a stent is sometimes necessary in patients with dissections, arteriosclerotic stenosis, and as a rescue method when other techniques fail. To prevent stent thrombosis, it is necessary to add antiplatelet therapy.6 7 There are several methods of antiaggregation, such as oral administration of loading doses of aspirin and clopidogrel, intravenous aspirin, or antiplatelet drugs, such as abciximab. To avoid stent thrombosis, we used intravenous abciximab at half the dose (0125 mg/kg), as a single bolus without a maintenance dose, and the next day we added oral aspirin 150–300 mg and clopidogrel 75 mg daily. This pattern partially follows the recommendations of Anderson et al 8 who reported the use of abciximab when a stent is necessary during a recently ruptured aneurysm embolization. But unlike Anderson’s protocol, we did not use a loading dose of 300 mg of clopidogrel the day after endovascular treatment; we administered the usual dose of 75 mg of clopidogrel. The aim of our study was to evaluate the incidence of symptomatic intracerebral hematoma associated with our antiplatelet protocol. After institutional review board approval, a retrospective review of a prospectively collected database of large vessel occlusion endovascular treatment was conducted. All patients treated with intravenous abciximab in the angiography room between January 2015 and March 2018 were included. The following data were collected: patient demographics, location of vessel occlusion, dissection, National Institutes of Health Stroke Scale (NIHSS) score, time from the clinical event to endovascular treatment, duration of the intra-arterial procedure, wake-up and unknown onset strokes, concomitant use of recombinant tissue plasminogen activator, use of intracranial or extracranial stents, use of intracranial or extracranial catheter balloon, dose of intravenous abciximab, modified Thrombolysis in Cerebral Infarction (mTICI) results, initial use of intracranial or extracranial stent versus use of stentriever, time from symptom onset to stenting, volume of pre- and post-treatment infarction, Alberta Stroke Program Early CT Score (ASPECTS) before treatment, time from symptom onset/stenting to follow-up scanning, time from stent to aspirin and clopidogrel, complications, and neurological outcome scale at 90 days. 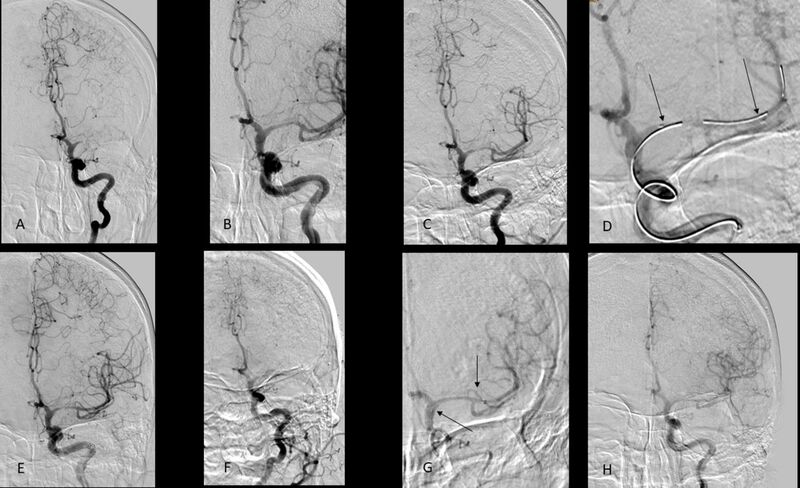 A tandem lesion was defined as a middle cerebral artery occlusion and occlusive or near occlusive disease of the cervical internal carotid artery (ICA), and was identified on admission CT angiography (CTA) and/or in the angiosuite. A hypodense lesion was measured by CT and was considered the pretreatment and post-treatment volume of the infarction. Successful recanalization was defined as mTICI grades 2b or 3. When a hyperdense lesion was observed on the control CT after the endovascular procedure, another CT was performed after 24 hours to distinguish the contrast of hemorrhage. A 3 month favorable outcome was defined as a modified Rankin Scale (mRS) score of ≤2. All procedures were performed by senior physicians with experience in endovascular techniques, including stenting. Endovascular treatments were performed with the patient under general anesthesia or conscious sedation. Type of sedation was chosen on an individual basis by the neuroradiologist and anesthesiologist. Procedures were performed via a transfemoral transarterial femoral approach. A 80 cm 7 F introducer sheath (Super Arrow-Flex Sheath Introducer, Teleflex, Ireland) was advanced into the distal common carotid artery. The distal 5 or 6 F catheter used was a Navien (Medtronic, USA) or Sofia (Microvention Terumo, USA). Trevo catheter (Stryker, USA) or Rapid Transit (Cordis, Corp. USA) were the microcatheters selected. Two types of stentrievers were used: Trevo (Stryker, USA) or Preset (Phenox, Germany). Usually, a bolus dose of intravenous heparin was not administered. During the intervention, heparinized pressure saline was used. The need for a stent was determined by a neuroradiologist. An Enterprise (Cordis Corp, USA) stent were used for intracranial stenosis and Carotid Wallstent (Boston Scientific, USA) for extracranial vessels. When it was necessary to dilate an extracranial vessel in the extracranial setting, a Viatrac catheter balloon (Abbott, USA) was used to dilate the stent. If it was necessary to dilate the intracranial artery, stenting with two different types of balloon catheters were used: an over the wire type Gateway (Stryker, USA) or a monorail PITA catheter balloon (Phenox, Germany). The use of abciximab was considered in all patients with stenting. The dose was a bolus of abciximab 0125 mg/kg without a maintenance dose. The next day, aspirin 150 mg and clopidogrel 75 mg were added. The double antiplatelet regimen was maintained for 6 months in the case of intracranial stents and for 1 month for extracranial stents. In both cases, at the end of the double antiplatelet therapy, aspirin was prescribed indefinitely. After the endovascular procedure, the patient was admitted at the neuro-trauma intensive care unit in order to maintain systolic blood pressure <130 mm Hg. The next day, cranial CT was performed to evaluate the ASPECTS and any possible complications. Stent patency was monitored by the following methods: Doppler ultrasound, transcranial Doppler ultrasound, MR angiography (MRA) or CTA, 3 or more months after stroke, depending on the protocols of the different hospitals. Frequencies (%) and with means or medians (SDs) were used to describe the cohort study. The Fisher exact test was used to compare our antiplatelet protocol (half bolus dose of abciximab) with the one described in the literature (abciximab 0.25 mg/kg plus maintenance doses). P<0.05 was considered significant. All statistical analyses were performed in Excel Windows (Microsoft, Redmond, Washington). During the study period, 373 patients with emerging large vessel occlusion were treated by the endovascular method at our center. Intravenous half bolus dose of abciximab was administered to 99 patients. Demographic data are shown in table 1. Prior to the stroke, all patients had an mRS score of 0 points. Stenting of the target lesion was successful in all cases. There were three cases where stenting was not necessary. The first was a transgression in abciximab dose to halt a malignant cascade of re-thrombosis of an M1 occlusion treated with 8 mg of abciximab with 10 000 IU of heparin without stenting. At the end of the procedure, mTICI 2a was obtained, and the patient had an mRS score of 2 at 90 days. The second was a patient with an occlusion at the top of the basilar artery where abciximab was used without stenting. This patient had a dominant right vertebral artery occlusion, with a hypoplastic left vertebral artery with a very thin segment distal to the origin of the posterior ICA. Recanalization was achieved with partial deployment of a stentriever without full recovery. A new angiographic run showed good repletion of both posterior cerebral arteries. This patient had a very low score on the NIHSS scale (5 points). In order not to use a double stenting method, a half bolus of abciximab was administrated and a new run was done after 15 min. There was no trace of new vessel occlusion. Given these findings, a cautious attitude was adopted. This patient had a very good recovery (mRS score of 1 at 90 days). The third case was a patient with a middle cerebral artery stenosis diagnosed after successful stentriever recanalization. A cautious wait after administration of a half bolus of abciximab was adopted and the final vessel diameter was considered safe to avoid a stenting procedure. Nine of the 16 dissections resulted in tandem occlusion lesions. An iatrogenic dissection was treated with stenting in four cases. In four patients, intracranial and extracranial stenting were deployed (two tandem occlusion and one dissection). In six cases, an acute occlusion of the stent occurred; two tandem occlusions with cervical stenting and no distal recanalization, and four failed rescue stentings after unsuccessful thrombectomy. No sICH was observed in our series. There were 8 cases of HI1, 5 cases of HI2, 4 cases of PH1, and 0 cases of PH2. A comparison with usual doses was made based on the Ciccone report.10 This study reviewed clinical trials where abciximab was used in stroke treatment with the usual regimen (0.25 mg/kg intravenous bolus followed by a 0.125 mg/kg/min infusion for 12 hours). In this review, there were 31 cases of sICH out of 604 patients. In comparison with our data (0 sICH), a statistically significant difference (P=0.0150) was found. Mean pretreatment infarct volume was 15.94 mL (SD±19.00, range 0–102.5). Median pretreatment ASPECTS for anterior circulation stroke was 8 (IQR 6–9). Mean time from onset to double antiaggregant drug administered was 904.23 min (SD±263.07, range 256–1523). Mean time from onset to post-treatment CT control was 1425.96 min (SD±813.91, range 384–7447). Mean post-treatment volume infarct was 53.46 mL (SD±61.38, range 0–341.2). Eighteen patients died before the first patency test at 3 months (11 malignant strokes, 5 respiratory infections, and 2 cardiac pathologies). In 8 patients an intracranial stent had been used (3 M1, 4 vertebrobasilar, and 1 intracranial carotid artery), and in 10 patients an extracranial stent (9 internal carotid and 1 vertebral artery). 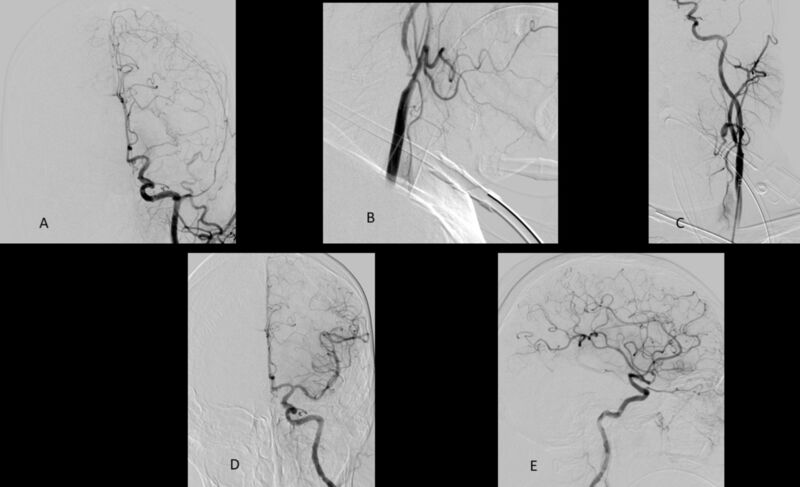 In the follow-up of 81 live patients at 3 months, 72 had a patent vessel, 4 had an occluded stent (2 extracranial internal carotid artery, 1 middle cerebral artery, and 1 intra- and extracranial stents), and 5 had no control. Extracranial vessels were evaluated in 43 patients by Doppler ultrasound, 10 with MRA, and 5 with CTA. Intracranial patency was evaluated in 7 cases by transcranial Doppler ultrasound, in 6 cases with MRA, and in 5 cases with CTA. Patients without stenting were assessed with CTA (two cases) and MRA (one case). Of the six patients with acute stent occlusion, four died from malignant cerebral infarction, one remains with the occluded stent, and one stent is permeable without residual stenosis, demonstrated by repeat ultrasound and CTA. In the recent 2018 AHA Guideline for the Early Management of Patients With Acute Ischemic Stroke,11 administration of abciximab in the treatment of acute ischemic stroke (AIS) is considered potentially harmful and should not be performed. This conclusion was based on a Cochrane review of IV glycoprotein IIb/IIIa receptor antagonists in the treatment of AIS, which found that abciximab was associated with a significant risk of ICH. The majority of the trial data were applied to abciximab, which was studied in the AbESTT trial (A Study of Effectiveness and Safety of Abciximab in Patients With Acute Ischemic Stroke).10 The phase III trial finished early because of an unfavorable risk–benefit analysis. Although this recommendation is based on intravenous treatment, frequently the use of abciximab is discussed if a stent is needed in AIS endovascular treatment. Anderson et al 8 reported that a half bolus doses of abciximab (0.125 mg/kg without maintenance doses) with 300 mg of aspirin and a charge dose of 300 mg of abciximab the next day, with 300 mg aspirin and 75 mg of abciximab as maintenance doses, is safe in the treatment of a recent bleeding aneurysm. We believe that in stroke patients, dose loading of abciximab may be avoided to prevent sICH. With our protocol, there was no incidence of sICH, which means that the use of half a bolus dose is safe in this dangerous situation. The use of stents in our protocol varied between extracranial (Figure 1) and intracranial vascular occlusion (Figure 2 and 3). In the extracranial scenario, a stent is placed in all patients who have an occlusion of the cervical internal carotid artery or vertebral artery caused by arteriosclerotic disease or dissection. In the intracranial circulation, we use an intracranial stent under two circumstances: (a) a stenosis >50% is underlying the occluded vessel shown after thrombectomy or (b) as a rescue method when our usual technique has failed. In this way, we try to avoid re-occlusions in the period immediately following treatment. For this reason, it is likely that the use of stents is more frequent in our center as our pharmacological treatment is less dangerous. In three non-stenting patients, abciximab was administered. The first was a patient in their third decade with a malignant coagulation cascade. This patient underwent seven successful stentriever recanalizations followed by a rapid re-occlusion requiring the use of 8 mg of abciximab and 10 000 IU of heparin. Sometimes this problem can be observed with continuous re-thrombosis of the recanalized blood vessels. The reason is not well understood and there is no consensus on treatment in these situations. However, if a malignant cascade is observed, concomitant use of heparin may be mandatory. The other two successful procedures of non-stenting may be supported by the ‘wait and see’ method if stenosis is shown after effective recanalization. Treatment with only one potent antiplatelet drug could tried, and a stent may be deployed if abciximab alone is not enough. We believe that this option carries the same risks as the use of antiaggregants and does not have the benefit of the plaque or intima stability achieved with stents. This theory must be counterbalanced with the long term complications that can occur with the use of mandatory antiaggregation after stent placement. We had six acute stent occlusions. Two carotid cervical stenting occlusions occurred because distal recanalization was not possible. Clearly, if blood does not flow, stent occlusion will be the rule. Four of the six occlusions occurred when we used the stent as a rescue method after the stentriever failed. We speculate that in some patients there is no possibility of effective recanalization because there is no recoverable distal cerebral tissue, although a malignant cascade of the coagulation cannot be excluded. It has been suggested that in patients with underlying vascular pathology, use of a stentriever itself may aggravate a pre-existing local endothelial vulnerability, in the sense of increased plaque instability and rupture, local thrombosis, and final re-occlusion.13 Of these six patients, only two are alive; in one patient, the control ultrasound still showed the occluded stent, but in the other patient, the stent was permeable to both CTA and ultrasound. The latter patient was considered to have acute intraprocedural stent occlusion because the flow observed in the final angiographic study was ineffective after intrastent clot formation. However, the circle of Willis was correct so they were able to have good functional recovery. This shows that intrinsic recanalization can be obtained even under very poor flow conditions if powerful antiaggregants are used to allow at least minimal intrastent flow. It is not always possible to distinguish between atherosclerotic stenosis and residual/resistant thrombus, although it can substantially affect the risk of stent occlusion or re-stenosis.14 For this reason, we do not classify the etiology of occlusion in our series. Treatment of tandem occlusions involves two technical approaches: the anterograde and reverse techniques. The anterograde strategy focuses first on proximal occlusion (ICA stenosis/occlusion), delivering the stent before mechanical thrombectomy; the reverse technique is to perform stenting after mechanical thrombectomy. We prefer the first option in the treatment of artheriosclerotic lesions; the second one is our preferred method for preventing early carotid re-occlusion in the dissected vessel.14 The use of intracranial stenting in our center is used when underlying stenosis is observed after mechanical thrombectomy, or as a rescue method. In dissection with distal occlusion, our method is first to perform mechanical thrombectomy and then the dissected segment is treated with one or more stents. If the patient presents with a dissected vessel without distal occlusion, we assume that the problem is caused by hemodynamic failure and we deploy stents in order to obtain good intracranial flow. Delayed follow-up of our series showed that the use of supra-aortic stents is very effective. It is probably related to the fact that in most of these cases there was an atherosclerotic origin with a long period of progressive stenosis that could induce more vigorous compensatory blood flow through the circle of Willis and/or create a good pial collateralization network. However, there are a large number of intracranial vascular occlusions caused by embolic clots that can cause worse results because cerebral vascularization is injured in a sudden event. This may explain the relatively poor results in the placement of intracranial stents in the second group of patients. Limitations of the study include the monocentric retrospective design that may have been affected by selection bias. The average age was relatively young (62 years) and so the results could be different if a new cohort of older patients were evaluated. There was an absence of a control group using another antiplatelet regimen. (A, B) A tandem lesion. Filiform stenosis with clots in the left internal cervical carotid artery and left M1 occlusion. (C) Stenosis resolution with a carotid Wallstent. (D, E) A modified Thrombolysis in Cerebral Infarction grade 3 was obtained after one pass of a Trevo 4×20 stentriever. Rescue method. (A) Left M1 occlusion. (B). After treatment with the Trevo 4×20 stentriever a good initial result was achieved. (C) After 5 min, flow is slow and there are new clots in the M1. (D, E). A 4×39 mm Enterprise stent (arrows) is placed, but the stent only partially covers the pathologic area. (F) After 5 min a new occlusion appears. (G) After a failed attempt to cross the stent, we engaged the stent with a guidewire and pulled it back to obtain a new location of the stent from the distal internal carotid artery to the M1(The new position of the stent is marked with arrows). (H) The final run shows a good result (modified Thrombolysis in Cerebral Infarction grade 2b). (A) Basilar artery occlusion. (B). After treatment with the Trevo 4×20 stentriever, stenosis of the basilar artery with distal clots is shown. (C) After deploying the Enterprise stent, good recanalization is obtained (modified Thrombolysis in Cerebral Infarction grade 2b).
. The safety and efficacy of abciximab in acute ischemic stroke: results of the Abciximab in Emergent Stroke Treatment Trial. Ann Neurol 2002;52:S64. Contributors FD designed the data collection tools, monitored the data collection, wrote the statistical analysis plan, analyzed the data, and drafted and revised the paper. RO designed the data collection tools, monitored the data collection, and revised the paper. EJ-G analyzed the data and revised the paper. IBR monitored the data collection and revised the paper. MDB monitored the data collection and revised the draft paper. RVM monitored the data collection and revised the paper. Ethics approval The study was approved by the Comité de Ëtica de la Investigación de Córdoba.